The years 1975-85 brought dramatic examples of volcanism, from the 1980 blasts of Mount St. Helens, through the continuing lava rivers of Hawaii, to the tragic eruption of Colombia's Nevado del Ruiz in 1985. However, the decade also brought less spectacular volcano stories, from eruptions that never took place, through pumice floating on vast expanses of open ocean, to small eruptions of special concern only to those who happened to be too close to them. This book reports the decade's full spectrum of volcanism: small eruptions as well as large, and subtle warning signs as well as notorious disasters. By treating the full range of volcanic activity, this extensively indexed book provides a baseline of global volcanism: a context into which events of the future can be placed for comparison or measurement. The heart of the book consists of reports from the SEAN Bulletin, a monthly publication of the Scientific Event Alert Network (now the GVN Bulletin). Correspondents were asked to correct errors in their original descriptions. These changes were incorporated into the text, and newer references were added. 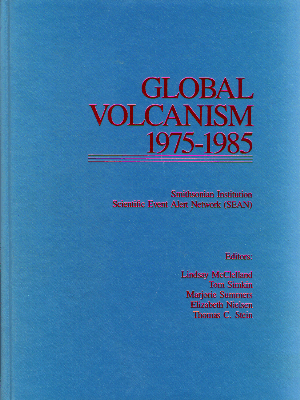 Smithsonian Institution/SEAN, 1989, Global Volcanism 1975-1985: Prentice Hall, Englewood Cliffs NJ, and American Geophysical Union, Washington DC, 657 p.
These are no longer for sale, but may be found on the secondary used book market. A limited number are available free for personal or institutional use. Contact GVP by email using the link at the bottom of the page.